So, almost a couple months ago I was lucky enough to take in a few races from a criterium that was held, literally just down the block from my apartment. The University of Chicago Velo Club puts on this day of races titled, Monsters of the Midway. I spent an afternoon scoping out places to try and hone my rusty photography skills. Much of the day was spent trying to get images that went against the typical "cycle-sports-action-shot" model. Here are a few of the best from that day. 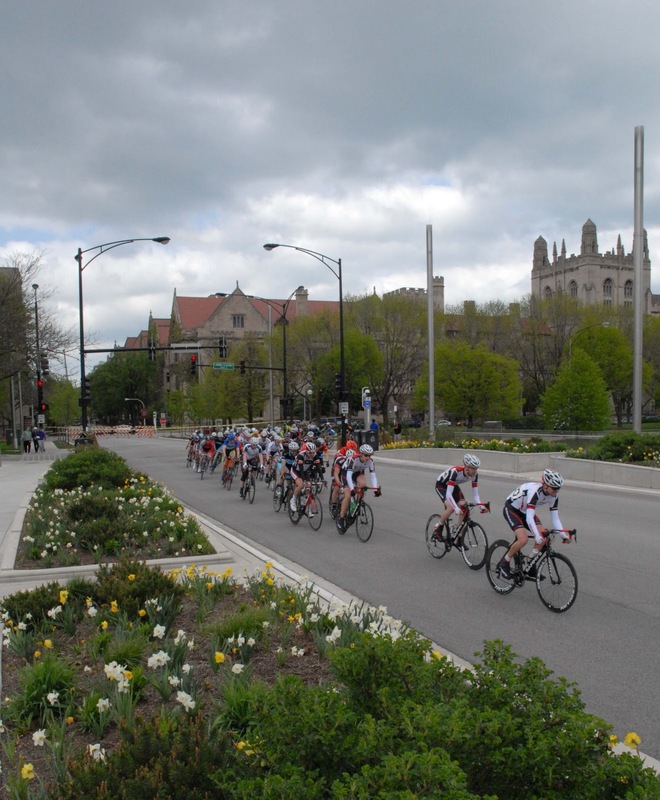 The race circled around the area of campus known as the Midway Plaissance, which was actually once part of the famous Worlds Columbian Exposition. The lovely architecture of the University of Chicago campus provided a nice backdrop for much of the days racing. I liked the juxtaposition of the flowers and the race in this shot. The bikes whizzing by the flower beds made me think of some Spring Classic race in Europe with cyclists passing through fields of tulips with windmills in the background. I shot two different versions of this photo. 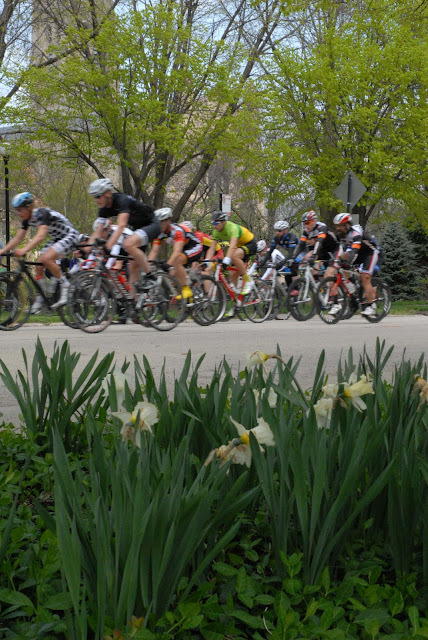 This one features the cyclists in focus and the flowers in the foreground out of focus. The next one I went for the flowers in the foreground in focus. The riders ended up being blurred, which has the effect of conveying the speed somewhat. I'm not sure which version I like better, this one or the one above. I'm kind of partial to this one though. This shot somewhat violates the common photography "Rule of Thirds," but I like it anyway. When I shot it I was focusing on the riders. Later, when I was looking at the images, I liked the presentation of the riders crossing the geometric pattern of the crosswalk. 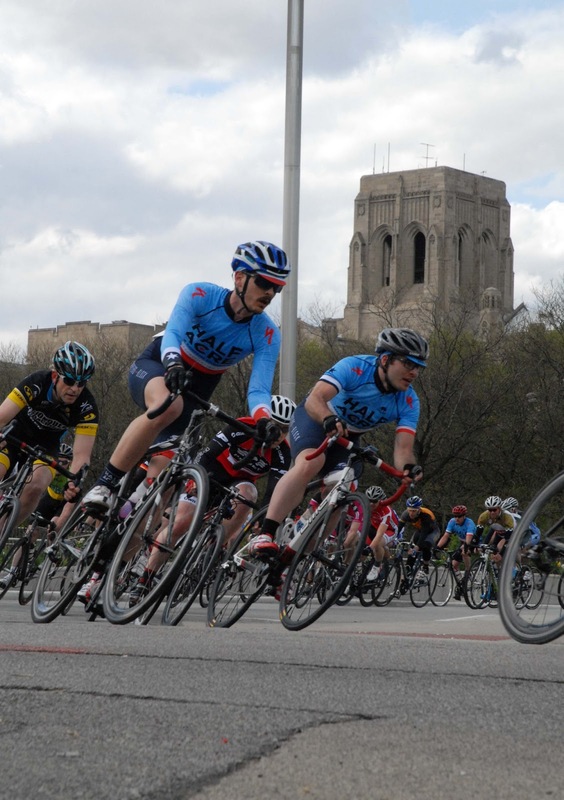 This comes under the category of those all too common cycling action shots, but I still like the massive church in the background, visible just through the trees, and the perspective was good. 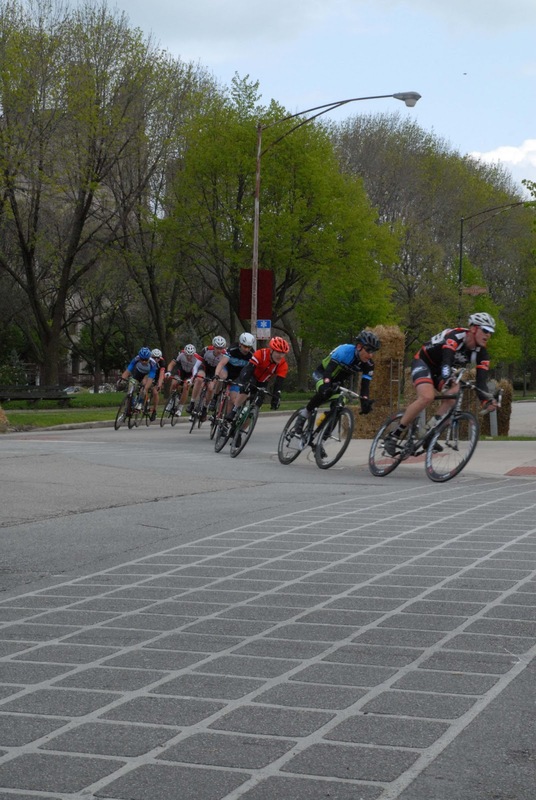 I had a good angle close down to pavement level that allowed me to get close to the riders but not too close. I liked the perspective of this shot as well. I was able to stand a couple feet above street level on the edge of this planter with all the flowers. 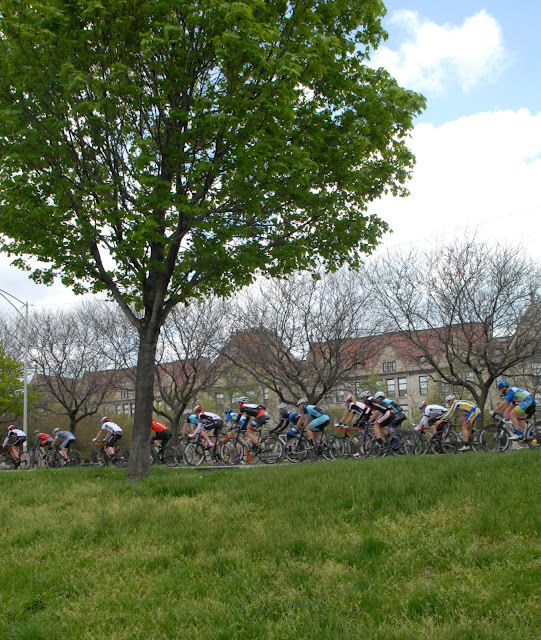 I thought it was neat to get shots that were somewhat above the typical eye level of the cyclist as many shots usually are. That large church was looming in the background as well. Much more visible here without so much of the trees blocking it as in those ground level shots. Shots like these help convey a sense of place I think. I like shots that also convey the atmosphere of the race versus just having a string of action shots that are pretty much interchangeable from race to race. 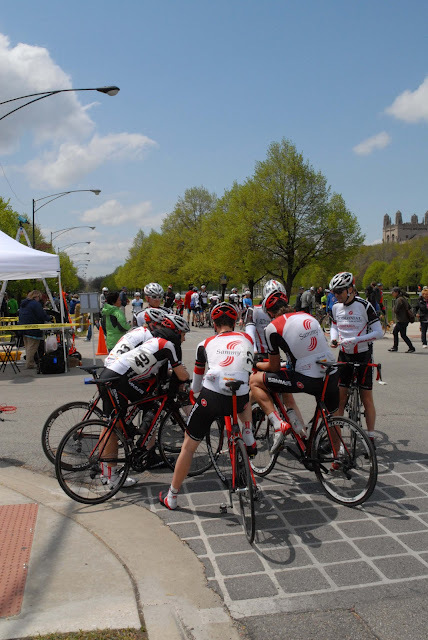 Here a group of riders were having a confab after the race. Presumably a debriefing regarding their performance with strategizing for the future. Or maybe they were just planning on where to go eat and have a beer after the races were over. Some of the women relaxing moments before the beginning of one of their races. It always strikes me how much the women racers seem to smile. Even on the course in the heat of competition, many of them seem to have a smile on their face. Not so with the men. It's all poker faces there. Maybe it's part of the manly spirit of competition to be all seriousness, all the time? Finally, one last mundane action shot with more monumental religious architecture in the background.